There are billions of colors. From fuchsia pink to lemon yellow, from mint green to cobalt blue, from eggplant purple to ruby red and everything in between. A monitor can display 16 million of them, a printer or printing machine can print off thousands. When you consider that the human eye can on average distinguish 300 colors and a more practiced eye sees around 1000 colors, then the range of a printing machine is still quite large by comparison. Because a printer or printing press cannot print all 16 million colors of a monitor, it is sometimes rather difficult to exactly reproduce a color. In order to be able to print, a design in RGB must be translated into CMYK, for example, or into specific colors from an ink range. 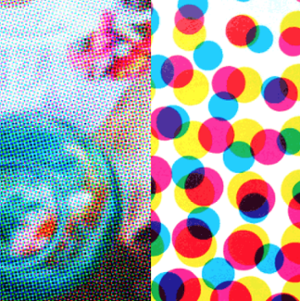 When translating into CMYK, color can be printed based on four-color printing. Each color is printed over the others in certain percentages as dots. These dots can only be seen with a magnifying glass. Color arises by means of the light that is transmitted by the inks and reflects on the substrate (the paper). Of course, this substrate is also very crucial and will affect the perception of color. By the way, the K in CMYK stands for black. Whatever method we use, in reality printing is often a compromise, the outcome of which is not always satisfactory. The color range (GAMUT) of the human eye, RGB and CMYK is shown in the figure below. Tip: To make a color consisting of four CMYK values pure and more intense, we can bring it back to an essence of three values. This is done by setting the lowest color value to 0 and by subtracting this removed value from the other two colors and add the same value to the black. When comparing two colors (or color points), we get the delta E, or the cumulative deviation. These are the cumuli of the differences between the a, the b, and the L values. The formula is the square root of the sum of the squares of the differences of the Lab values of two objects to be compared. In general, a delta E of 2 is considered to be acceptable all over the world. But this depends on the material, structure, density, etc. In other words, the difference cannot normally be observed. In actual fact, however, it is the case that for yellow, a delta E of 0.5 already constitutes a significant difference but for red, sometimes a delta E of 5 may be acceptable and thus not optically discernible. Research by the Color Navigator Institute gave rise to a system that maps and arranges colors that are as pure as possible, for our brains as well as production. The Color Navigator System builds further on CIELab, inter alia, and through further research has redefined the color range to the useful range that is evenly perceptible to our eyes and brains and perfectly reproducible. The Color Navigator Institute clustered colors that are close to each other and have the same properties, and then arranged them according to style, type and culture. It thus becomes easier to identify, name, arrange, communicate colors and ultimately to use them. Interested to see how our experts can help you with this? Feel free to contact us. All images © Color Navigator.